This is interesting what you say about the speed. I downloaded one of those apps that slows down the original song, and some songs are on my practice schedule simply because I cannot do them at 100% speed. So you are saying move on and maybe revisite the song later for speed? While we are talking about speed, one more thing that I would like your opinion on: out of the options 1) playing along with the original song, maybe at lower speed, 2) playing with a metronome and 3) just playing by yourself and tapping your foot, how do you practice? Do you do all three or start with one and then change to another? This is interesting what you say about the speed. I downloaded one of those apps that slows down the original song, and some songs are on my practice schedule simply because I cannot do them at 100% speed. So you are saying move on and maybe revisit the song later for speed? Exactly, don't get too hung up about it if it sounds OK but a bit slow. It doesn't matter how you time yourself but using the track or a metronome is going to be the most accurate. I find it is really good to record yourself periodically so you can compare to what you can do at a later date; plus it's much easier to spot what needs attention. Remember nobody is going to judge you on here, everyone's been where you are in the learning process. I've only posted two videos up and it took me 6 months to pluck up the courage. I'm glad I did because people have been great at offering advice. It's good to get another persons perspective on your playing. For me it is a combination and differs depending on why I learn the song. If it is for band use, I start by playing the song for my self. Getting the changes and the progression internalised. Then I play along with the original slowed down. I up the tempo as I get more and more familiar with the way it is played in the played back version. When at 105% (yes, 105%) I am ready for rehearsal with the band. If I learn a song for my own purpose I do the same steps as before. But during that first stage I also start humming the song to get a feel for the melody. When the previous steps are done I play on my own to a metronome and work on the singing. I've not tried playing along with an original. What has worked for me is playing along with Justin on his song video lessons. Initially when he is explaining and playing real slow. Eventually I've been able to play through with him at the start of the lesson when he plays the song to show how it should sound. I don't play songs with metronome but do strumming practise with a metronome. For songs I just play and after a while sing, just trying to get into a groove .... foot tapping, head bobbing, whatever comes to try and get into it. No idea if I am faster or slower than original, as long as it sounds ok. Which would be based on how I have the original in my head. But really whatever works for you to learn each lesson, play songs ... steady rhythms, smooth changes, clean chords. What worked really well for me was I created: playlists of songs as I was learning them, and once a week or so I would put on the playlist and play along with Bob Marley, Bob Dylan etc. I don know if it was important or not, but whilst playing and singing along, I imagined myself playing to friends, to girls, at the pub, at Wembley etc. I started a month ago and I am at stage 2. I got most of the 1 minute changes up to speed now, except the ones with dmin in them. I do train all changes, not only the ones which justin says. When I get one at 60 changes per minute two days in a row, I skip that one the next day untill I get them all. I am only practising two songs now, three little birds and 5 years time. I can play along with bob in three little birds but 5 years time is too fast. Still looking for a good app on macbook to slow down songs from spotify. I practise both songs with metronome and foot tapping. I try to start slow but find it difficult to keep rhythym whem I am below 50 bpm. I can play all chords clearly on my guitar so instead of 5 mins only practising strum pick strum I added trying air changes with the first three chords. I only do ear training two or three times a week because it becomes too merorized instead of listining what sound it is. How longer post than I meant to. Ow yeah I did post a recording of myself playing. Its in roadcases. A really rough version of the chorus of three little birds . I will post somethin there every few weeks. so i am trying to learn how to play guitar and my cousin gave me an old one of his that he never uses. 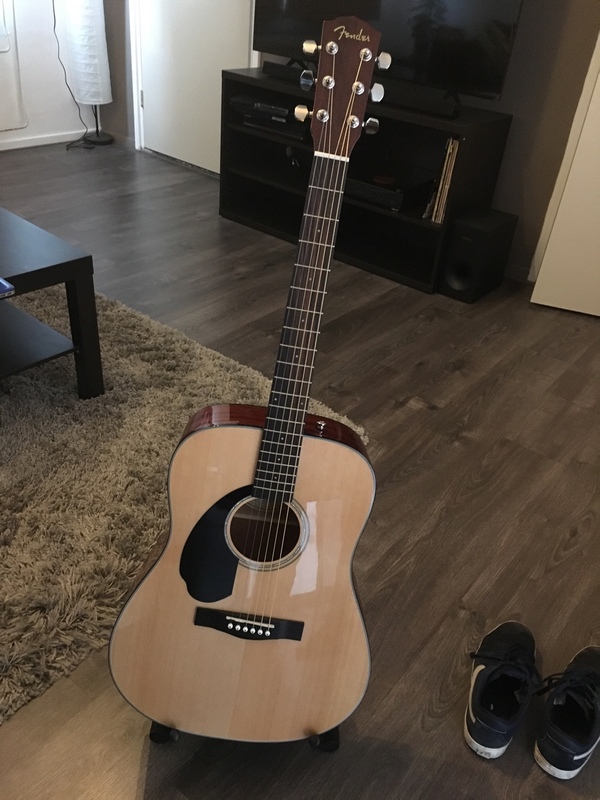 I dont know anything about guitars so how do i know if the guitar is good quality or if i need to get a new one. To me it doesn't sound like most acoustics but i dont know anything about guitars. A little more information would help. Like what brand is it? Pictures would help even more. string acoustic or an electric. Start with Justin's beginner course anb deside from there. If you know you keep wanting to learn guitar I think you are better of with a steel string acoustic. A good one to consider is the fender CD60S. They are around 200 euros, and you get a lot of guitar for your money.